Signs of engagement with the cosmos appear frequently in Brian Groombridge’s work, representing a hunger for knowl edge beyond ourselves and a faith in such knowledge even if it is minuscule compared with what we don’t know. With our ambitious but limited vision, we are the “small telescopes” in the title of Groombridge’s retrospective at YYZ, the artist-run space he cofounded in the late ’70s, when he was an emerging conceptualist in the Toronto scene. “Small Telescopes” assembled 17 works from the past 23 years. One had to look up to see Comets Tell of Great Distances Traveled (1989), which hung high on one wall. The work consists of five framed sheets of paper printed with the years of the last five sightings of Halley’s Comet, beginning with Edmond Halley’s original view in 1682. The years are enclosed in parentheses and rendered in different typefaces, which initially appear specific to the respective time period but on closer inspection prove harder to place. Inset into the same wall at waist height was a white rectangular alcove holding three small, white triangular blocks, each with a word printed in thin, blue letters: the first read BOOKS, the second MAPS and the third, sitting slightly askew of the other two, CHARTS. In Groombridge’s poetics, books, maps and charts are guides to what he calls “undeliverable space,” the kind of histori cal, cultural and existential place that requires more than just geographical coordinates to reach. Untitled and dated 2002, the alcove work conjures museum display, commercial signage and children’s games, three of the many esthetic influences the artist has adapted in his sculpture-based conceptual work. In a Groombridge exhibition, words take on material qualities, while physical objects may possess the transitory or provisional aspects of words. 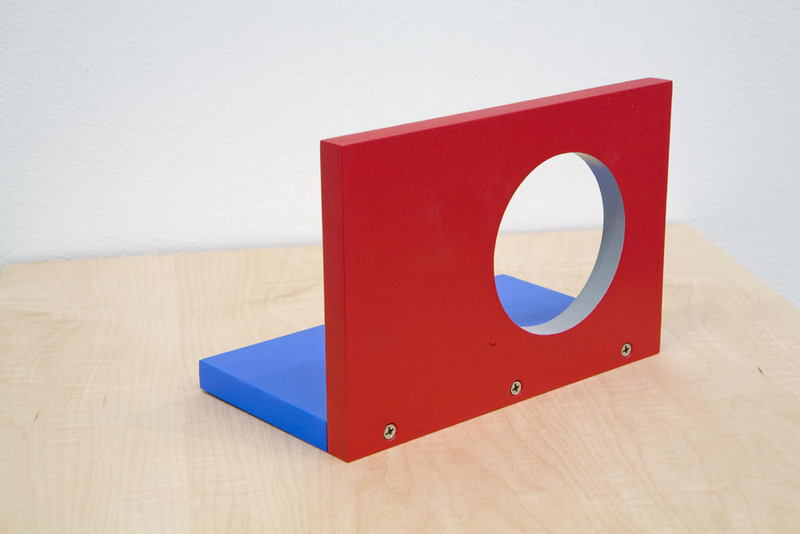 Two untitled painted-aluminum sculptures from 2008 suggest a “chair” and a “radio,” though their forms remain unspecific, as if they were abstractions of these objects rather than examples of them. The “radio” is composed of two small rectangular panels: a horizontal one in blue and-screwed to its side and bearing a circular gray-edged holean upright one in red and yellow. The sculpture’s geom etry and palette link it to De Stijl, though it cannot be said to represent any particular historical style. The “chair” is blue, modernist and flat, about 1 inch thick, resembling a diagram matic cutout. Projecting out from it are one square and two rectangular plates: gray, white and yellow complications of the flatness, blueness and chair-ness of the work. Hanging from the ceiling by a wire, the heavy sculpture remained perfectly still, neither mobile nor stabile (to use Calder’s terms). At a concurrent solo exhibition at Susan Hobbs, the primary work, exhibited on its own in the main gallery, was The Astronomer’s Chair (2012). Attached to each of two tall flagpole structures is a diaphanous flag, one featuring a drawing of an 18th-century chair meant to support the reclined body of a stargazer, and the other bearing a grid of standard playing-card symbols. As in his other works, Groombridge here highlights the in-between nature of the human condition, in this case placing the viewer somewhere between science and chance. Publishing error: Groombridge joined the YYZ Board six months into its inception.